Two stories that take you from a college campus to the interiors of Africa. Two stories that span the difference between the possibilities in imagination and the depth of loss. Two stories that bend the spectrum between celebrating marriage and losing loved ones. Find out what it means to leave one's self open to true love in the boomerang short "Moving in Circles." Understand the price of commitment in "The Four Cs." And learn about this phenomenal new concept in short fiction from Prairie Sky Publishing. 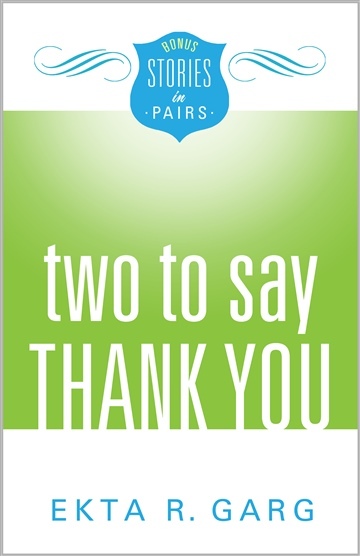 Readers will encounter characters that mirror themselves in Two to Say Thank You, an ebook designed as an offering of gratitude for taking a chance on the author's work. Get your copy now! Since the start of her publishing career in 2005 Ekta has edited and written about everything from health care to home improvement to Hindi films. She has worked for: The Portland Physician Scribe, Portland, Oregon's premier medical newspaper; show magazines for home tours organized by the Portland Home Builders Association; ABCDlady.com; The Bollywood Ticket; The International Indian; and the annual anthologies published by the Avondale Inkslingers, based in Avondale, Arizona. In 2011 Ekta stepped off the ledge and became a freelancer. She edits short stories and novels for other writers, contributing to their writing dreams. She is also a part-time editor for aois21, and she reviews books for her own book review blog as well as NetGalley and Bookpleasures.com. Prairie Sky Publishing, the company she launched to make her work available to readers, serves as the publishing arm of Ekta's professional writing blog, The Write Edge (thewriteedge.wordpress.com). When she's not writing, Ekta is a domestic engineer--known in the vernacular as "a housewife." She's married, has two energetic daughters who keep her running, and she divides her time between keeping house and fulfilling her writing dreams on a regular basis.